A bright new kitchen with more space and new cabinets is nearly every homeowner's dream. Gilmore Construction is a kitchen and bath specialist. They'll look at the space you have, draw up plans, and help you choose colors, styles, and finishes. 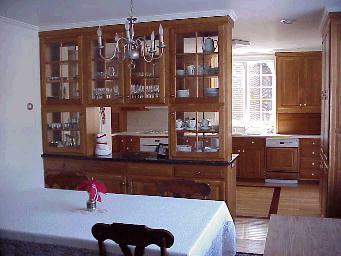 For example, Gilmore Construction offers the respected Brookhaven line from Woodmade Cabinets. Right now, Don says, people are going for the natural woodgrain look, including oak, hickory, and cherry. Kitchen flooring styles are changing, too. People are choosing hardwood floors for kitchens more often. Don also is installing a lot of the new laminate floors. This is an entirely new concept in flooring. It's similar to formica and is as easy to clean. It's a "floating" installation, which means the floor is assembled and placed on a bed of foam padding. It fits tightly even though it's not nailed down. Laminate flooring comes in formica finishes and a realistic hardwood look. Baths are always a popular remodel. Gilmore Construction is getting a lot of requests for whirlpool tubs. Don's pleased to note that there are models that will fit in the five-foot space of your present tub, including an overhead shower. So you don't have to move walls to get a spa tub. You can save water by replacing your old 5- to 6-gallon toilet with a new water-saver toilet that uses 1.6 gallons or less per flush. They're also available in a new comfort height that's more appropriate for adults.